Sometimes you can really get a good sense of someone from her website. I loooooove C.K. Kelly Martin’s website. There’s a lot to explore there, but you definitely don’t want to miss this part, on the kind of books she wants to write (and the kind she doesn’t). But first, read this interview and learn about her can’t-wait-to-read-it new YA novel, MY BEATING TEENAGE HEART. Then stick around to leave a comment and you could win your own copy. Your books are character driven and honest, which are the main two things I want in a book. Can you explain how you get to know your characters and your stories? How much do you know when you’re first beginning? What gets you started? Thank you! Because those are the two main things I want most in a book also. Usually I have a hard time pinpointing what gets me started – ideas start floating in and out of my head when I’m looking to write a new book but not all of them stick. For me, a character and their situation seem to arrive hand in hand. I start hearing the main character(s) voice(s) inside my head in moments of quiet and the story basically unfolds there with what feels like minimal interference from me. It sounds sort of airy fairy but the majority of the time I feel like I’m almost channeling people (who happen to be fictional instead of real) rather than making them up. Once this listening to the characters has been going on for a while and I feel I have a fairly good idea of what happens in their story, I transfer what I know into a chapter-by chapter-outline. It’s usually a really brief outline – a couple of sentences per chapter. In your new book, MY BEATING TEENAGE HEART, you’re exploring some new other-world territory. I’m curious if you knew you were heading there before you started writing. I knew I was heading somewhere unusual because after writing (I’m counting now), eight purely contemporary YA manuscripts in a row I really wanted to try something different. I thought I’d write a YA book about a zombie invasion but when I found, after the first few pages, that I wasn’t completely into it, the idea for MY BEATING TEENAGE HEART arrived. That was literally minutes after abandoning the zombie book* so maybe it’d been sitting in my subconscious in some form, waiting for its chance. What children’s book character would you have liked for a best friend? Are there any children’s books you reread with any regularity? I used to wish I could be friends with Anne of Green Gables because she had such neat ideas about kindred spirits and was always getting into “scrapes.” Tintin definitely would’ve been up there too because he was constantly going on cool adventures to exotic places. And I would be remiss if I didn’t mention Winnie the Pooh. One of the oldest books I have is a copy of THE WORLD OF POOH that my aunt gave me on my second birthday. I don’t think there’s anyone out there who loves a fictional character more than I loved Pooh when I was young. I still have a special fondness for him and had a Pooh calendar up next to my desk last year. Since I just read it recently one of the people I have to say that I know my thirteen-year-old self would’ve wanted to be friends with is Marley from WATER BALLOON because she’s not really concerned with doing “teenage things” or exuding a cool image of herself. She just wants to do what she wants to do and be who she is, not that she never feels odd or left out, but still, even when she feels that she doesn’t really want to be different than she is. I could also relate to the babysitting stories and her affection for her dog. 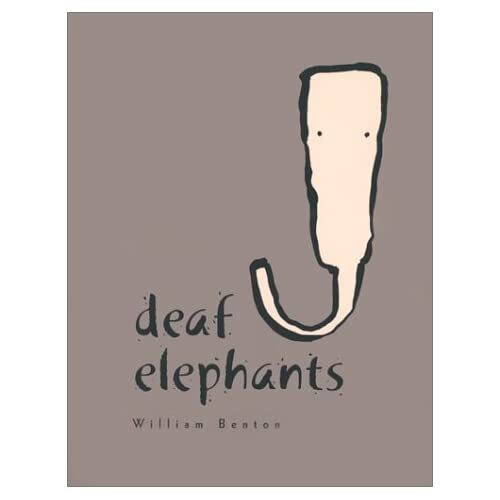 I don’t think it’s strictly speaking a children’s book but I have a tiny picture book called DEAF ELEPHANTS sitting on my living room shelf. It’s so simple that a child certainly could read and comprehend it and it’s something I reread every couple of years. It’s super short and stunningly beautiful in its message and spare style. It always makes me teary. I just finished line edits on YESTERDAY, my fifth YA book for Random House, which is going to be something different again because it has some sci-fi elements in it. It probably has more plot in it than anything I’ve ever written so I hope you still like it! Anyway, with that finished, I’ve gone back to rewriting my very first YA novel. It was never published but it still has my heart and I’m not willing to let it go so I’m rewriting it from scratch. It’s basically a first love story about a Canadian girl (Egyptian/Irish) and an Irish guy. They meet during a summer she’s spending in Dublin but when she gets home she can’t forget him. Is there anything you wish you could tell your pre-first-contract self? I’d let myself know, in as gentle and supportive a tone as possible, that this is going to be so much tougher than you think (and it’s not like I ever thought it would be easy! ), not the writing itself but the publishing business. I’d say that having a book published won’t make getting the next books out any easier but that I shouldn’t stress about it too much because you have to do what you have to do and one way or another, writing is a thing I have to do. For more information, visit Carolyn C.K. Kelly’s website. And if you’re wondering about that *zombie book, you can read the first few pages here. We’ll be giving away a copy of MY BEATING TEENAGE HEART. Just leave a comment here to be entered in the give-away. And if you don’t win, go buy the book and read it. You won’t be sorry. This entry was posted in Uncategorized and tagged Anne of Green Gables, C.K. Kelly Martin, character-driven YA, Deaf Elephants, My Beating Teenage Heart, Tintin, Winnie the Pooh, YA novelist, Yesterday. Bookmark the permalink. Yay! Book chance and awesome interview – all good from my viewpoint. I enjoyed this interview. I love the title My Beating Teenage Heart. And the cover is awesome. Enter me in the contest, please! I’m crossing my fingers. Oh, this is a lovely interview (and I’m really excited about this secret Sci Fi book, too!). Thanks! Wonderful interview. I fell like K. Martin’s sister, seeing that her favorite classics were mine too.